For the cake, preheat the oven to 140°C. Line a 25cm cake tin with baking paper. Beat the egg yolks and sugar until pale and fluffy. Melt the chocolate and butter in a pot over low heat until smooth and shiny. Add the melted chocolate mixture to the beaten egg yolks. Beat the egg whites to stiff peaks and gently fold into the chocolate mixture. Fold in the ground almonds then pour into the prepared tin and bake in the preheated oven, 40 minutes. For the ganache, place the coffee bean in the cream and warm over a double boiler (do not allow the water to touch the bottom of the bowl). Strain the coffee bean, add the cream to the dark chocolate, and stir until smooth and shiny. 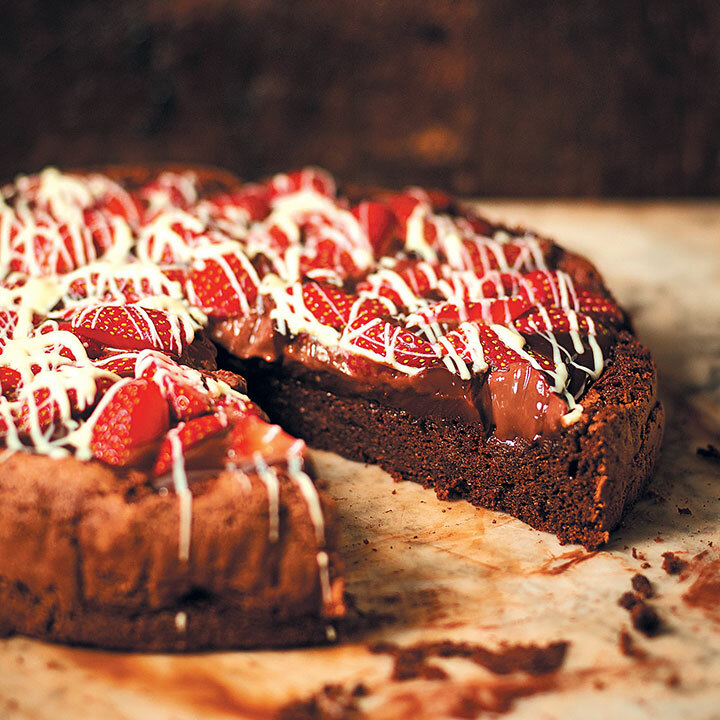 To serve, top the cooled cake with the ganache and decorate with the strawberries and melted white chocolate.